Chatter is a kind of self-excited vibration which may occur in the milling process and has several negative effects such as poor surface quality and severe tool wear. This paper presents an active chatter control method based on H∞ almost disturbance decoupling problem with measurement feedback and with internal stability (H∞-ADDPMS) and piezoelectric stack actuators. First, a milling process model considering regenerative effect is constructed to find out the milling conditions when chatter occurs. Then, the whole active control system and constructing procedure of an active controller based on H∞-ADDPMS is proposed. Next, the milling process is simulated and the H∞-ADDPMS controller is calculated based on cutting force coefficient identification, frequency response experiments, and modal analysis technique. 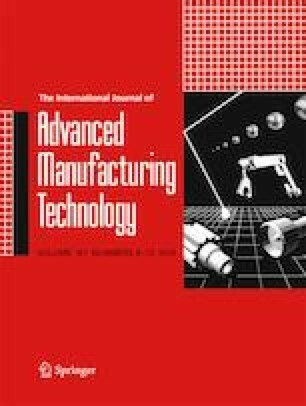 Finally, the active control experiment is carried out on a computer numerical control (CNC) milling machine to verify the feasibility and effectiveness of the proposed active control strategy. This work is supported by the National Natural Science Foundation of China (Nos. 51575423, 11772244), the Fundamental Research Funds for Central University, and the Natural Science Foundation of Shaanxi Province (2017JM5120).